39 Steps has Hitchcock really starting to find his groove. Great blend of suspense and comedy, with the chemistry between Donat and Carroll standing out in particular. Cracking good fun, what! Surprising how soon Hitchcock masters his trademark thriller narrative style, even if the filmmaking isn't at his peak yet. Still, Hitchcock throwing random people into spy conspiracies is the greatest thing since sliced bread....or maybe before sliced bread, since our guy here is seen cutting up a loaf. 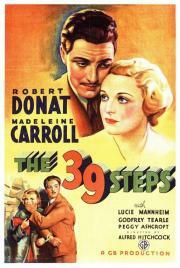 Annabella Smith: "Have you ever heard of the 39 Steps?" You're gonna need to concentrate because I lost focus a bit, in the beginning, missed some plot points and they did not do a recap later. After the rather tense and serious beginning of a proper spy thriller, it takes a sharp turn into road movie slash comedy. Pretty good actually. It's bookended by a slow beginning (Miss Smith is annoyingly cryptic) and an abrupt, too-easy ending (Hannay figures things out super quickly) but in between them is fun fugitive plot that constantly dishes out unexpected twists: Just when you think he's getting away he gets caught; just when you think he's done for he finds a new way out. Dashes of comedy (see the hilarious impromptu political speech scene; Hannay and Pamela's handcuff experience) mix well with the film's solid suspense. Like a prototype for what Hitchcock would later do. Perhaps great in its day but not aged too well esp when comparing it to Hitchcocks later work this looks like a rough draft. Plenty of interesting camera choices and visual flair, but the story is crammed into key moments then abruptly and neatly wrapped up for an ending without much mystery, tension or excitement.